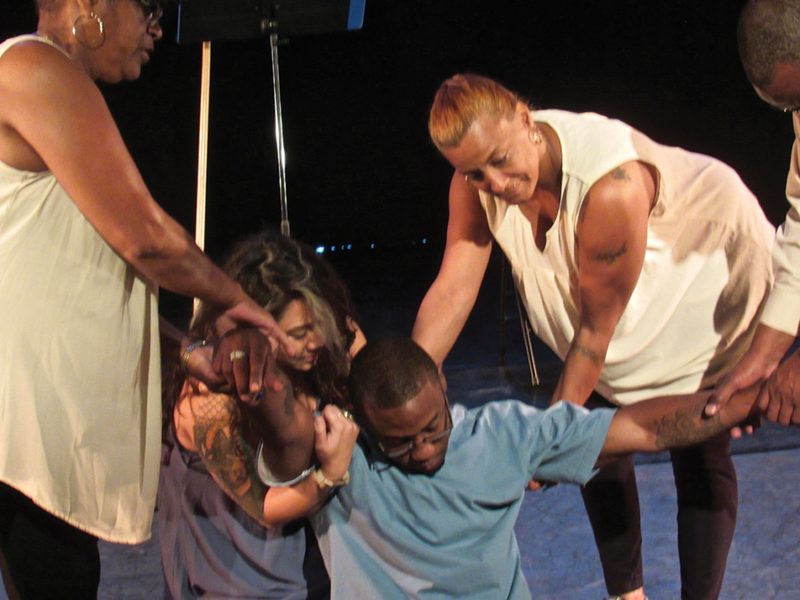 The “right road lost/FOUND” is a play based on the memories, life stories and experiences of five formerly incarcerated men and women who navigate their personal paths through reentry into the free world. The production had its debut at the Los Angeles Trade-Technical College (LATTC), a community college in South Los Angeles. It was also performed at the Los Angeles County Probation Department. The performance piece is based on the writing of Antoineeta Phillips, Pam Torrence, Bree Cortum, Anthony Jenkins Sr. and Milo McCollough. “It felt good performing in front of the probation department,” Phillips told San Quentin News. “When performing in prison, this is what we were trying to achieve: for the COs (correction officers) or someone from the administration to come and see that we have talent. “But we were our own best audience. They [the prison staff] never showed. I hope with this performance they can see that ex-inmates or exconvicts have talents. I hope this can go further,” added Phillips, who served six years in California women’s prisons. Susan Tanner, executive director of TheatreWorkers Project, said the performance piece is not your typical play, because the production incor- porates movement, poems, and lyrical performances. Tanner is both the producer and co-director. Tanner conducts a work- shop program with the Dad’s Back Academy, a Los Angeles reentry organization, run by The Friends Outside. The program uses theater to reintegrate parolees and formerly incarcerated men and women back into society. “When I was writing it, all these memories came up for me, things when I was a child, things I haven’t thought about in years,” said Pam Torrence, who served four months in a federal detention center. “I didn’t realize that I had forgotten all those things. Pam Torrence, Antoineeta Philips, Milo McCollough, guest artist Whitney Wakimoto and Anthony Jenkins Sr. They all came to the surface. Some things made me very emotional. Some things were bittersweet, especially when I talk about my mama,” Torrance added. Torrence credits her love for theater and performing at an early age for giving her confidence to command a stage. “We did a Christmas play when I was incarcerated and I sang,” Torrence said. “I did drama in junior high and high school. I was a drama major. I’m a performer; I like to act out,” she said jokingly. The LATTC performance brought out more than 100 students to attend the play. The college itself has a diverse student body of formerly incarcerated, undocumented students and veterans, along with its mainstream enrollment. 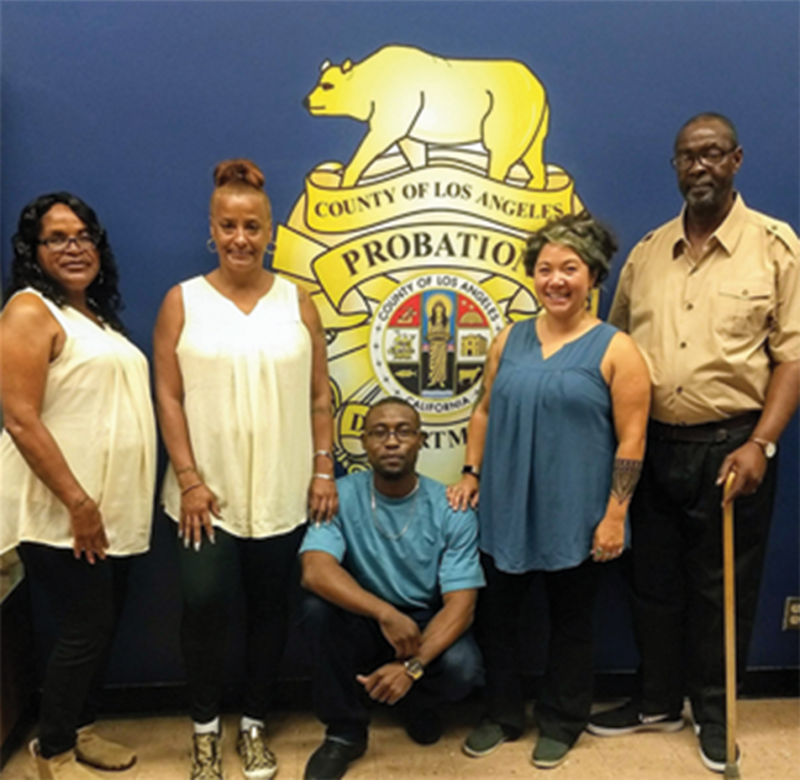 The discussion was included in the probation department performance in an effort to give the audience an opportunity for more in-depth knowledge about each person’s life and goals. Actress and reentry volunteer Whitney Wakimoto joined the cast after one cast member dropped out. Wakimoto has a master’s degree in theater. She holds a parenting and acting workshop at Lynwood Detention Center with female prisoners. “It was an interesting process because I was like thrown in. They are telling their story and I’m not telling mine,” Wakimoto said. “I had to find where I connect with the story and step back and let it be their show. “It’s about giving the women the safe space to let their guard down and to be witness, to play, to have a childhood for a moment,” Wakimoto added. Tanner said Wakimoto was a useful addition. “I’ve seen her go from just say- ing the words to her really embracing the characters. I think she helps drive the piece,” Tanner added. The play is one part of a line of productions by returning citizens. “A Man Like Me” and “On the Brink” are also being performed on college campus- es. The TheatreWorkers Project and Dad’s Back Academy are providing returning citizens a chance to stand up and be heard. The writing workshops were led by Tanner, Jim Macdonald, Marlene Mc- Curtis and Rubén Guevara. Playwright Bonnie Banfield shaped the material. Alexa Kershner did the staged choreography.